Innovation is something that is either capitalized on by the developer, or taken to new heights by others at a later time. Later would be, well....now. It's been 50 years. There is nothing inherently virtuous about being "unique" in concept...there are many unique failures. I have unique plans for a square wheel and a ten-sided stop sign (plus I plan to charge about double existing prices), but they don't seem to be going anywhere. Dardick's design was an abject failure for numerous reasons and demand was zero. That = failure. If you have a personal admiration for Dardick's designs, that's on you. I don't see the visionary figure there. Back in the second grade, I developed a design for a series of vehicles which ran on compressed air. As they rolled down the road being powered by compressed air, there was a crank on the axle which pumped the tanks full again. Algore would have loved it. It was as green as you could get. Maybe a failure as intended, but I'd love to have it for canister rounds. "Battery! Two rounds, double canister. Load!" And as for clusterbombs there is this. Edited by mnm, 27 September 2011 - 1015 AM. Interests:You seriously DO NOT want to know. +1. If for no other reason, the damn Glock Heads that will NOT shut up about it. I'd have to disagree with you. The basic "tround" concept is workable, but it's a case where the materials technology just hasn't caught up with the basic design. Couple the Tround ammunition handling and rotary chamber with a caseless cartridge, and the helical magazine concept pioneered by Calico, and you might have a decent stab at an alternative to the HK G11. I have heard rumors that the initial design by HK for the G11 was highly derivative of this idea, and the only reason they went with the clockwork nightmare they eventually settled on was that the Dardick patents were held by a large US defense company that wanted way too much money for them. That, and the same thing that drove the downfall of the Wankel engines--Sealing the two sides of the "breech". Problem is, Dardick was way ahead of his time, and the materials technology and chemistry just isn't there to enable his ideas to work. Yet. Give it another twenty years, and we may see some of his ideas in another format. I was going to throw some Combat Reform Sparky gems just for the tangential Hell of it...but he's changed the sight, and I'd rather go through the Chinese Bandits mess than through whatever new bilge he's vomited up. You Americans DO realize what a useful sabotage weapon Sparky could be...? Chauchat = possibly the worst industrial production...not only of machine gun specifically, or even fire arms in general...thing that I could possibly think off. Actually it was better than the horrible reputation it has received and it was easy to produce in large numbers under not so optimal conditions. Granted some batches suffered from shoddy production as some of the manufacturers were not really seasoned gun-makers and the 8mm lebel was maybe not the ultimate round for a light machinegun. The ones made in .30 for the US army was not good at all but then the weapon was never really made for that cartridge anyway. What is the possible advantage of square bullets and shells? 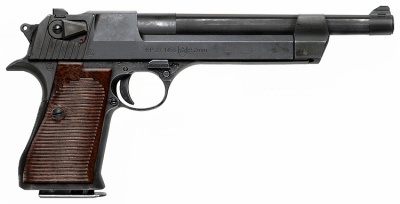 Model 1722 and Schuvalov did not fire square bullets, those fired fired shot and shells in shape of disc. Also shape of Schuvalov's barrel was ideal for canister. Was not worth bother in the end. Gaah. I could never go on a movie set where guns were in use. I'd be fighting the urge to thump people with rolled up newspapers every time I saw bad trigger discipline. Edited by rmgill, 28 September 2011 - 0203 AM. Here's an interesting article on a Blow Forwards design. The Hino-Komura. The principal problem was that gunpowder would sometimes leak from the paper cartridges in field conditions, lodging in various recesses around the firing cylinder. Hot gas leaking from the gap between the firing cylinder and the barrel would ignite this powder, which would in turn, ignite all of the powder in the chambers waiting to be fired. This is known as a "chain fire" and was a relatively common failure with early percussion revolving firearms. When this happened with the Colt Revolving Rifle, a spray of metal would be sent forward into the left arm and hand of the user. This fault resulted in an understandable distrust in the weapon. This fault resulted in an understandable distrust in the weapon. ... Some commanders instructed their men to fire the weapon only while supporting it directly in front of the trigger guard or by holding the lowered loading lever, which moved their left hand out of the path of danger during a chain fire. Other commanders instructed their men to load only a single chamber, preventing any chain fires from occurring. Loading a single chamber at a time also reduced the weapon to a single shot weapon, effectively defeated the entire purpose of having a repeating rifle. And this is something I had never even heard of, the Porter Revolving Turret Rifle. I also saw a discussion where poor parts interchangeability was mentioned as part of the problem. According to the speaker (whose name I can't recall), the newer, original guns worked fine. I'll also mention the Reising sub-gun. While fine in a clean, civilian environment, it was a failure in the harsh environment of combat. Colt also fumbled the ball with the 2000 9mm and Double Eagle pistols. Based on the Double Eagle, da? 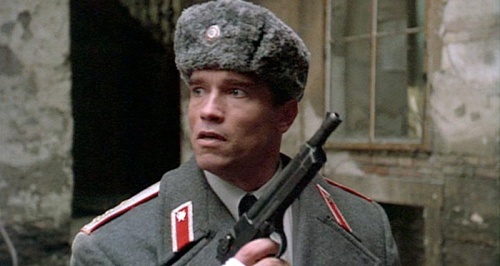 In Arnold's hand, it looks positively petite. Edited by shep854, 28 September 2011 - 0814 AM. I remember seeing a bunch of revolver rifles in the Red Army museum in Moscow similar to that as well as a bunch of 'carbines' similar in size to most lever actions. Always wondered why they didn't take off.